Sunday was day nine of the opened buttermilk, so after ranch dressing and scones, I thought buttermilk biscuits would finish off the quart nicely. When we were in grad school in Arkansas, my husband fell in love with a kind of disgusting looking fast food called a Volcano. It consisted of broken up biscuits topped with sausage gravy in a giant Styrofoam cup. Although I never had one, I knew I could do better, and since the Volcano continued to live on in his fantasy cuisine, I figured out how to do it, just not in a Styrofoam cup. Biscuits and gravy is a simple, but satisfying dish, made better here with homemade buttermilk-lard biscuits. The biscuits came out so well, I couldn’t stop taking pictures, obviously. Cut in 10 tablespoons cold lard (you could substitute butter or experiment with combinations of lard, butter, or vegetable shortening). I used my hands to rub in the lard, but you could use a pastry cutter. Don’t overwork the dough or worry about some large pieces of fat. Stir in 2 cups cold, shaken buttermilk (mine was whole milk buttermilk, but you can use the low-fat version). When mostly combined, use your hands to round up the dough and knead lightly on a floured surface. This dough has a really nice soft texture that holds together well. 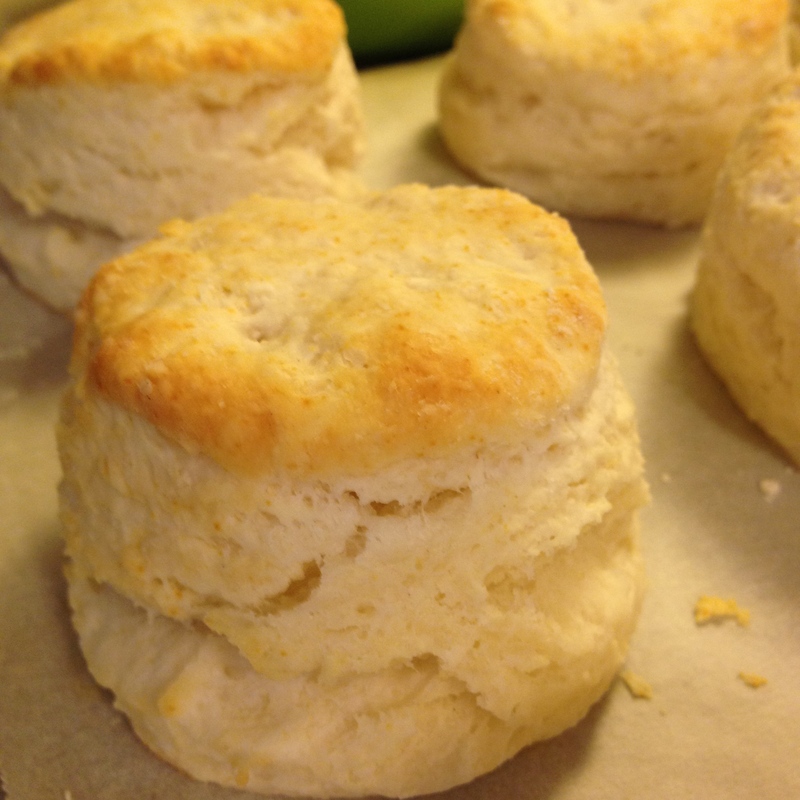 Pat out to about 3/4″ thickness and cut biscuits with a 3 inch cutter. I re-worked the dough twice more to finally get 16 biscuits. The remaining small circle of dough can be twisted once into a cruller-like shape and baked with the rest, if you have room for it—my mother always referred to that one as the dog biscuit. This dough can easily be re-worked a few times without affecting the final result; it’s a very moist, soft dough that does not quickly toughen, like some biscuit doughs. Place about 1 inch apart on parchment-lined baking sheet. Bake for about 10-12 minutes, until high and brown. Some people like to brush the tops with butter after baking, but I like the crisp tops, especially when you are going to smother them with gravy. I like the crisp tops with or without gravy. Brown the sausage over medium-high heat in a large skillet. Commercial sausage is pretty lean and does not make enough fat to make your gravy—I didn’t see any fat in the bottom of my pan, so you really have to add the butter to make the white sauce. Add the butter to the pan and reduce the heat to medium. When the butter is melted, stir in the flour and pepper until all the flour is combined with no lumps. Stir and cook for about a minute to cook out the raw flour taste, then slowly stir in the heated milk. Continue stirring until thick. You can set it on simmer for a few minutes, stirring occasionally so it doesn’t stick. 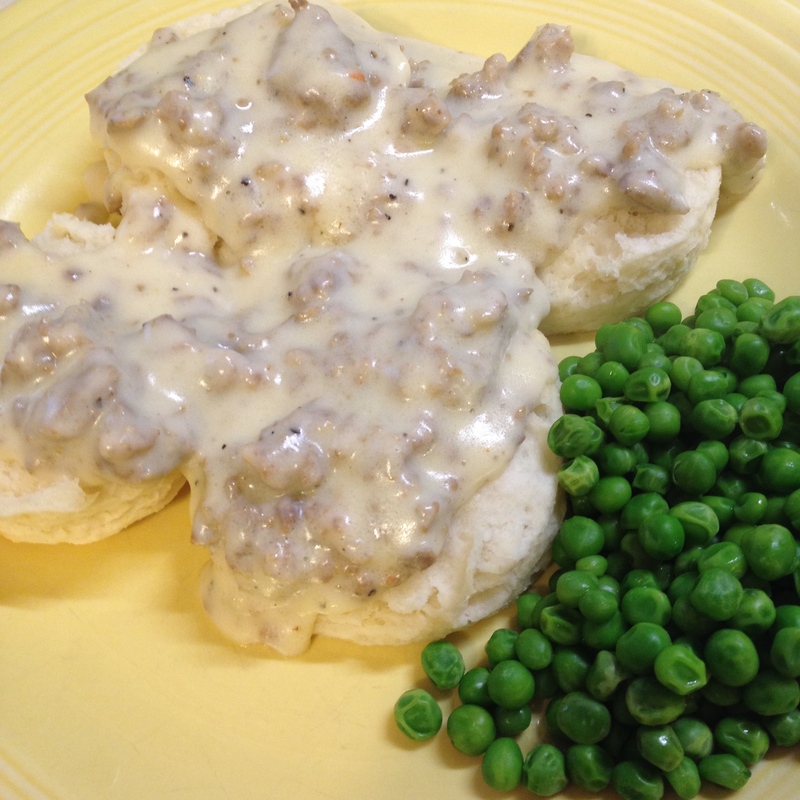 Serve gravy over split biscuits, with any side vegetable that you don’t mind running into your gravy. If you can stand any more fat in your diet, butter the split biscuits first. Or mix it all up in a large Styrofoam cup. The most fluffy and soft biscuits I’ve ever seen. They leaving me totally drooling!!!!! Wow!! those are some gorgeous biscuits!!! Soft and fluffy just the way I like them.